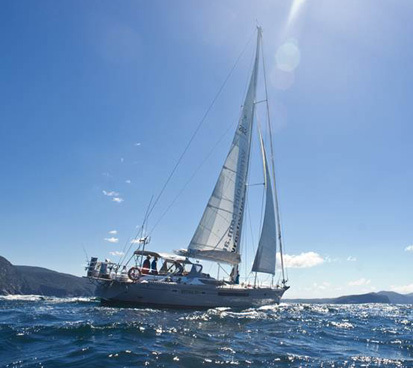 This full-day skippered yacht charter is a magnificent way to absorb the beauty of the Derwent River and beyond. Depending on the weather, this 8-hour cruise will take you to the end of the Derwent River and out into Storm Bay or the more sheltered waters of D'entrecasteaux Channel and Bruny Island. The return trip will see you following the Sydney to Hobart yacht race route, crossing the finishing line before berthing at King's Pier Marina. You will sail aboard a fast and comfortable 62-foot luxury ocean racer/cruiser, where you will be encouraged to participate as much as you like - take the helm, work with the winches, or sit back and enjoy the ride. Cabins equipped with air-conditioning and heating are available for your comfort and the deck provides ample room for sunbathing or just relaxing. As well as the thrill of sailing, you can enjoy some fishing, swimming, snorkelling - whatever takes your fancy! You will also indulge in the best Tasmanian fare for lunch, morning and afternoon tea. Tea, coffee, water and non-alcoholic beverages are provided throughout the day. A selection of fine Tasmanian wines and beer are available from the cash bar - at regular bar prices.